The Key to Healthier Living? Owning a Pet! A recent study in the medical journal, The Gerontologist, looked at whether there are health benefits for seniors if they have pets. (Anyone who has a dog or cat can tell you we don’t need a scientific study to know that the answer is yes!) In fact, the study showed that we get definite health benefits from the bonds they form with their companions, especially the benefits they enjoy from dog walking. Aside from being a source of frequent and longer exercise, dog walking is also associated with a lower body mass index, fewer visits to the doctor, and more opportunities for socialization. 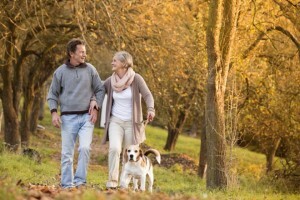 The Centers for Disease Control and Prevention (CDC) recommends that all adults should spend at least 150 minutes on moderate physical activity every wee k. For adults aged 60 years and above, walking is usually the most common form of physical activity – and dog walking fits perfectly in that equation! Social interaction, outdoor spaces, and camaraderie are a big part of the cornerstone lifestyle. All of our communities feature tree-lined streets, sidewalks and walking trails. Some include natural wooded areas, exercise trails, a lake with a boardwalk and canoe launch, and Bark Parks just for you and your furry friends! We love our pets! Check out Boxwell Glade Park at Barley Woods, our own green oasis!